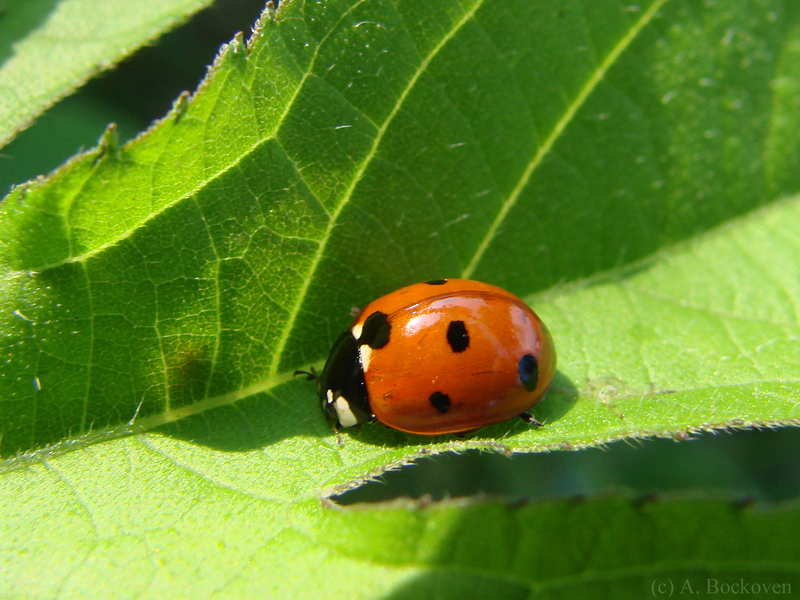 Cute ladybug on a leaf (Coccinellidae). This is a special retroactive emergency update post in honor of my mother’s birthday. Apparently I don’t post enough ‘cute’ bug pictures. (I think they’re all cute, but that’s just me.) Ladybugs have been demanded and will be supplied. 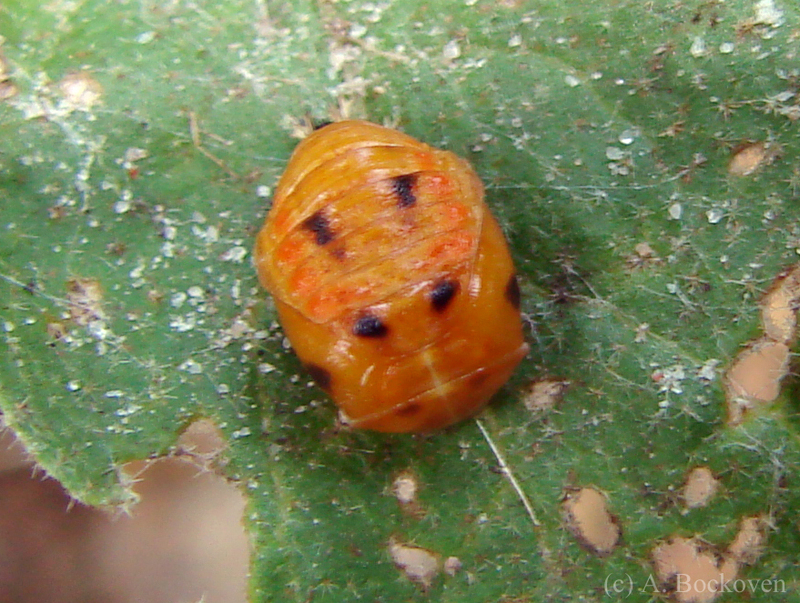 This is a somewhat less cute picture of a ladybug pupa. This is the ladybug equivalent of a chrysalis or cocoon. It is an inactive, resting life stage while the ladybug restructures its body into it’s adult form. The ladybug’s aposematic coloration which warns that it is toxic to eat allows it to pupate exposed on the leaves of plants in the midst of its primary food source–aphids. Many other beetles pupate underground, inside plants, or drop to the leaf litter at the base of trees to pupate. 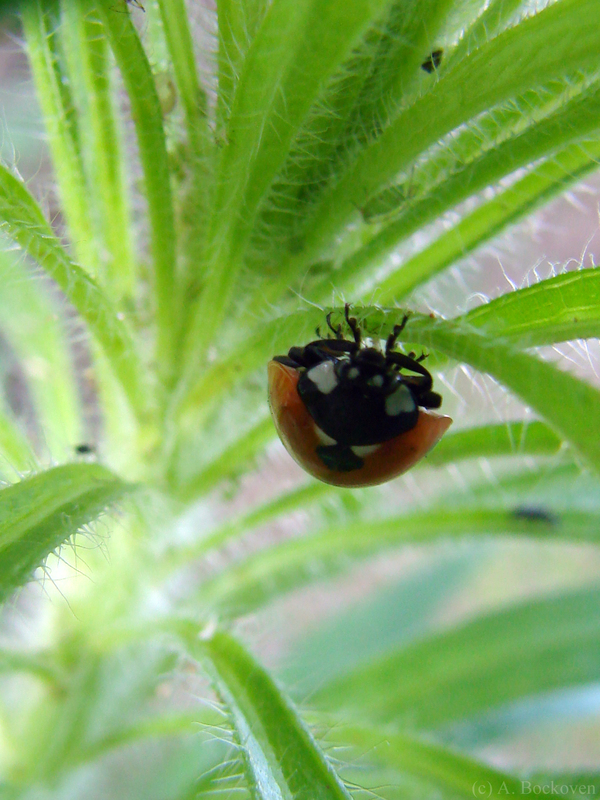 And finally a picture of a ‘baby’ ladybug. Awwww. I had to look closely to figure out what was going on in this picture. 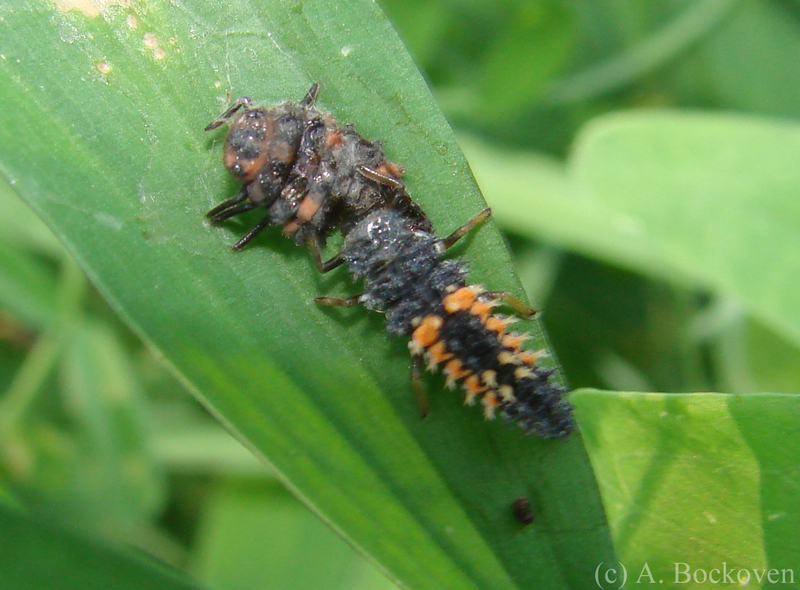 At first I thought it was a ladybug larva molting out of its previous skin, but in fact this larva is apparently cannibalizing another ladybug larva. Delicious! Here’s an interesting little trick I learned for figuring out the correct spelling for those weird mix-up common names that pop up frequently in insects (and other groups!). If the insect name contains a word that describes a group it not actually part of, the words are run together. So, we have ‘ladybug’ and ‘ladybird.’ Most people will have no problem remembering that a ladybird is not actually any type of bird. The ‘bug’ question may seem a bit more confusing, but remember ‘true bugs’ belong to the familyHemiptera. Beetles are not ‘true bugs.’ Thus, ‘ladybug,’ all one word. Other good examples of this are ‘butterfly‘ and ‘dragonfly,‘ neither of which are flies. What’s the point of this? Well, you can hazard a good guess that armyworms and silkworms aren’t actually worms. In fact, they are both types of caterpillar (butterfly larvae). Similarly glowworms is a widely used common name for a number of insect larvae, including those of fireflies. 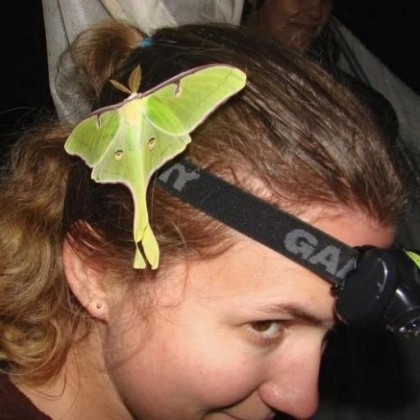 For that matter fireflies aren’t flies–they’re beetles! Baby lady beetles munching aphids. Another picture from right in my backyard! 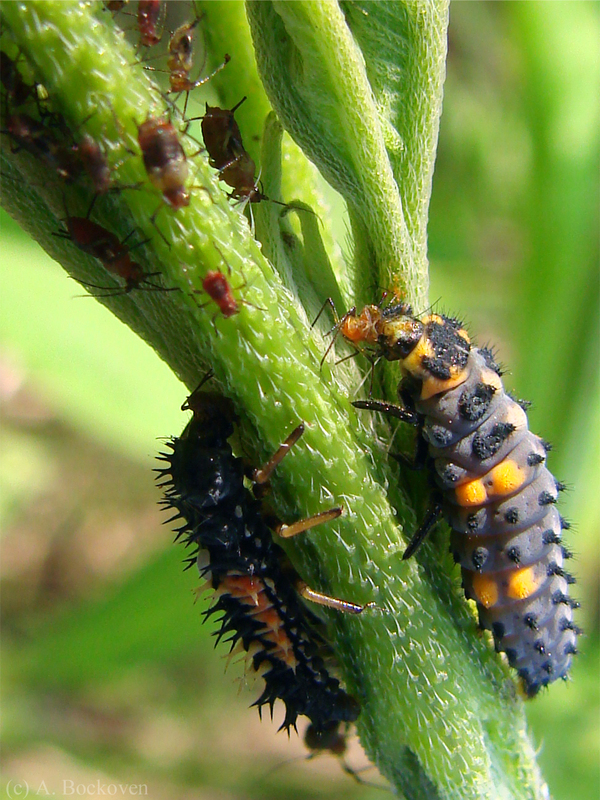 Unlike their pretty and popular adult form, ladybug larvae look a bit like they ought to be featuring as monsters in a horror movie, and they are indeed fearsome predators. (At least of the very tiny.) But just like grown up ladybugs these strange critters are the gardener’s friend, since their favorite prey are aphids. Another trait they have in common with adult lady beetles is their bright coloration. This aposematic, or warning, coloration serves to alert predators that they are not good to eat, due to the toxic chemicals they sequester in their bodies. Lady beetles belong to the family Coccinellidae, which takes it name from the word coccus, meaning circular, due to the adult beetle’s nearly circular shape. They are also generally almost flat on the bottom, allowing them to draw their legs under their armored exoskeleton and fit almost perfectly against a plant surface when under attack.